Welcome to the Suite Plants Blog! We are a leading green wall system manufacturer in North America and we love to educate and inform people about all things green! The green building movement is growing each day in the US and all over the world so visit us to learn about the latest trends in green building technologies and design thinking. Exterior living wall on building by Suite Plants. Living Walls, also known as Green Walls, Plant Walls or Vertical Gardens, are a method for growing plants vertically on indoor or outdoor walls. These vegetated wall systems usually consist of a growing medium, irrigation & drainage system and a method for affixing the system to the underlying structural wall. What’s the rationale behind having plants grow vertically? Why not just have them on the ground, in planters for example? In short, because floor space is a valuable commodity! Using vertical space is much more practical as it’s often open and usually isn’t being used for any other purpose. Let’s examine a hypothetical example: a restaurant. It’s nice to have plants in restaurants, but a restaurant with its floor covered in plants would go out of business fairly quickly! The same rationale can be applied to office spaces and residential spaces alike. 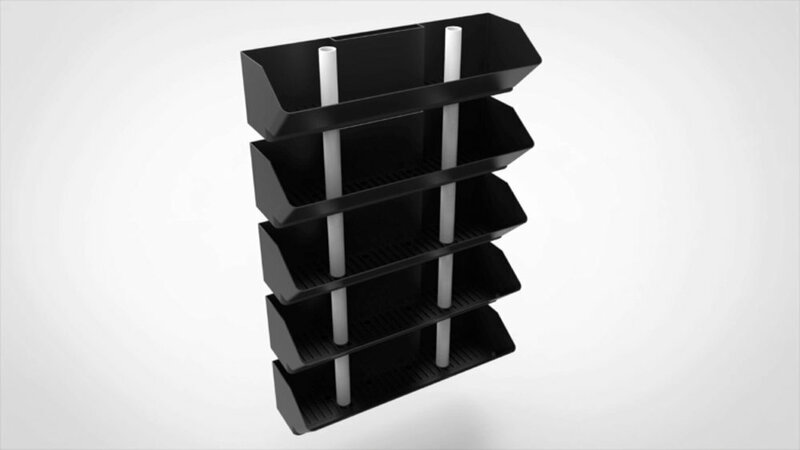 A configuration of angled plastic shelves, designed to hold both plant pots and water, is affixed to the wall. Once the support structure is in place, simply place the plants, along with their pots, into the shelves. In a container system, plants are taken out of their plastic grow pots and planted directly into pouches, cups or bins that each hold 1-2 plants. Below we have an example of a felt pocket system. Suite Plants’ Live Panel is a good example of a modular living wall system. In a modular system, plants are taken out of their plastic grow pots and planted directly into modules that each hold 6-12 plants. The Suite Plants Live Panel system uses high density foam plant cassettes or cartridges as the modules, but other manufacturers use plastic boxes, planters, or growth media tiles to hold the plants in place. As the above illustrations depict, the plants are placed directly into the individual plant cups within the cartridges. Once the cassettes are planted, they need to be inserted into the framing structure. For the LivePanel system, hollow aluminum extrusions are mounted to the wall and act as the frame for the plant cassettes. 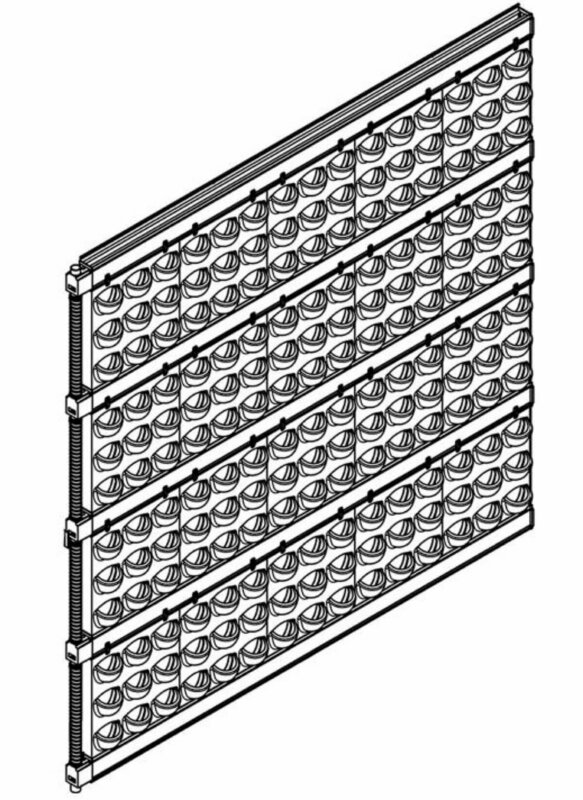 The plant cassettes can be inserted in between 2 rows of extrusions. The godfather of the living wall movement, Patric Blanc, is an artist and design genius in his own regard. His works are world famous and we have nothing but praise and accolades for his work. Patric uses a fixed one piece system for his living walls. In the fixed one piece system, plants are taken out of their plastic grow pots and planted directly into a quilt-like planting medium by manually cutting a hole for the plant into the medium. Designs can be intricate and highly customized. The finished living wall looks something like this! This has been a brief summary of the main approaches to growing plants vertically. In our next blog post, we will investigate the different methods for irrigating living walls. If you have any questions or comments about what we’ve written here, please feel free to write us an email. Thanks for reading!